지난 1월 오픈한 오설록 티하우스 청계천점은 홍대점, 삼청동점, 강남역점, 가로수길점 등에 이은 18번째 매장입니다. 티하우스 청계천점 인테리어의 주요 특징은 오설록의 고향인 제주의 자연을 담아낸 점입니다. 제주의 안개를 상징하는 미스트 그레이와 화이트, 현무암의 진한 회색을 바탕으로 녹차잎의 신록을 연상시키는 그린이 군데군데 느낌표를 찍습니다. 매장의 레이아웃은 높낮이가 다른 공간 세 개를 각각 다른 컨셉으로 나누었습니다. 첫 번째 제품존에서는 웅장한 천정과 제품을 돋보이게 할 수 있는 벽장들로 제품 하나하나에 품격과 무게감이 실릴 수 있도록 하였습니다. 두 번째 제주존에서는 제주의 현무암과 오설록의 헤리티지에 대한 고민을 표현하였습니다. 제주의 풍경을 담은 사진과 동영상으로 마치 제주도에 여행을 온 듯한 기분을 전해주고자 하였습니다. 특히 현무암을 쌓아 올려 우잣담을 형상화한 벽과 그 위에 걸린 제주 오설록 다원 지도는 상상 속 여행을 더욱 실감케 합니다. 세 번째 공간인 좌석 공간에서는 아늑함과 편안함을 느낄 수 있도록 꾸몄습니다. 따뜻하고 환한 햇볕은 벽을 최소화해 한결 넓게 구성된 실내 곳곳까지 넉넉하게 비춥니다. 날 좋은 5월, 통유리창으로 들어오는 햇살을 느긋하게 받으며 한잔의 차와 함께 제주도로 상상 속 여행을 떠나보시는 건 어떨까요. 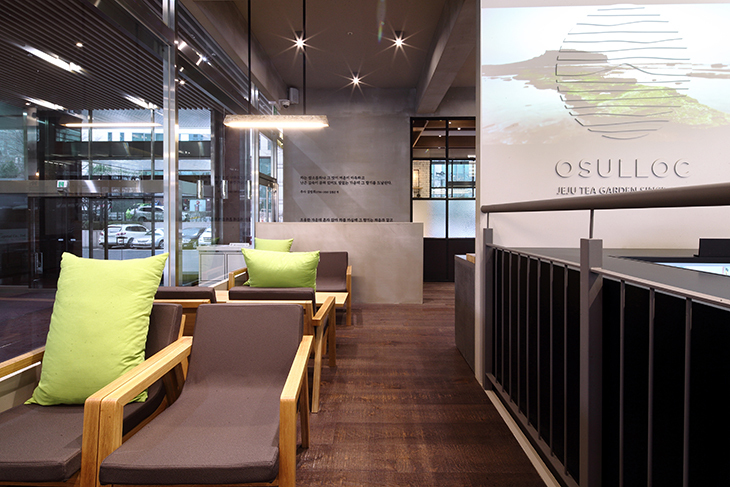 OSULLOC Tea House Cheonggyecheon Branch is the franchise’s 18th tea house following the opening of stores in Hongdae, Samcheongdong, Gangnam Station, and Garosugil Road. 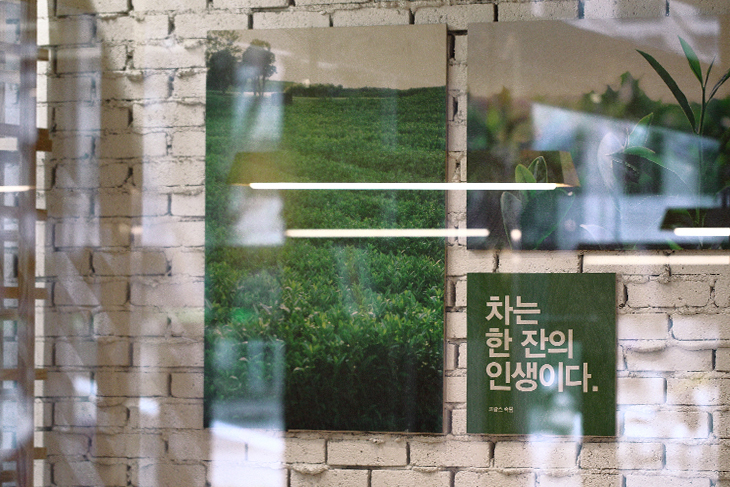 Tea House Cheonggyecheon stands out from over a dozen stores because of its interior, inspired by the untouched natural environment of Jeju Island as the very root of OSULLOC brand. Mist gray, white, and dark gray are each derived from thick mist and basalt. A splash of bright green, representing budding green tea leaves, accentuates the shop. The steps in the shop divide the shop layout into three different areas. The first area is the Product Zone with majestic roof and built-in shelves that highlight the displayed products. It was designed to add weight and classiness to every product on the shelf. The second area is the Jeju Zone, which reflects the basalt found in abundance on Jeju Island and OSULLOC’s commitment to heritage. Photographs and videos of Jeju’s landscape take the visitors to the beautiful island. The wall embodying Jeju Island’s indigenous ujatdam fences features a map of OSULLOC tea field locations. 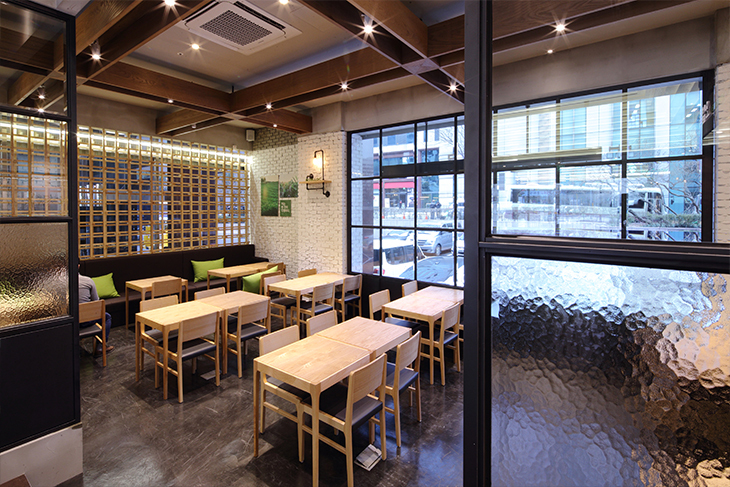 The third and last area is the café where patrons can sit and enjoy tea in a cozy environment. The warm, bright sunlight minimizes the walls, giving the space a much larger appearance. How about a cup of your favorite tea while basking in the warm May sun coming in from the windows?